Lots of people have done a ‘what’s in my camera bag’ type post and have dragged every last bit of kit out of each and every nook and cranny of their bags. Kind of interesting, but out of all that stuff I’d like to know what a person really uses to create her images. I have all the emergency and mundane stuff as any photographer does, but I don’t use those things all the time. Like extra memory cards and lens cloths. You need them, but they’re not part of your process per se. So here’s a shot of what I actually use most to do what I do. Starting at the top left with the tripod. It’s a travel model because I don’t want to lug my gigantic Bogen all over the woods on a regular basis. I bring that one if I need its weight or reach, but for woodland landscapes, close ups and some waterfall shots, this little Slik works just fine. I used to not bother much with tripods, but have come to realize it’s my sharpest lens. Next is My Precious. Every time I leave the 90mm home, I end up wanting it. Like the other day I went out with the 135mm instead, just to be different, and of course I came across something I’d like to have shot very close up and my regular lens wasn’t up to task. I was SOL. Sure, the 90 is heavy, but it’s worth lugging. I loves it. Duh, yeah, I use a camera. I wasn’t going to put it in the shot, but decided to because of the LCD screen. I use it all the time. It tilts, it swivels, it works like a waist-level finder and is almost the only way to shoot with my old lenses, especially for close-up work. Any future camera must have this feature. Seriously. And the lens on there is what I shoot with most of the time – the ZD 12-60mm f2.8-4. It has just the range I need for the type of photography I do. It goes very wide to a normal angle of view and focuses very close. It’s wicked sharp, quick focusing and fairly bright. I’m pretty spoiled by it. Remote shutter release. I don’t use it all the time, but when I have to time the shutter precisely, I do. If there’s no wind or I’m not worried about it interfering with the shot, I often use the 2 second shutter delay feature and that works pretty well. Of course if I forget to take it off and am handholding it’s irritating, but on a steady surface I like it. When it’s windy though, those 2 seconds can change everything and that’s when using the shutter release is the best solution. Neck knife. Sometimes you have to cut stuff to clean up a scene. A branch, a frond, whatever. I usually have this little blade handy for such tasks. And, let’s face it, a woman alone is not the safest thing in the world and if anyone gets up in my face they’re in for a surprise. Not that my spidey-sense has ever tingled, but having some protection is always a good idea. Filters. Basically just two – a polarizer and a neutral density. I have a set of graduated NDs, but I don’t use them often. Just for sunsets and rises mostly. The polarizer is great for bringing up the color in leaves, getting rid of glare on water and smartening up reflections when those are the star of the show. The ND is how you get those long exposures during the day. It’s like sunglasses for your camera. When doing waterfalls or flowing water shots, I use both. Beanbag. My camera lives on the ground and I wasn’t going to shell out a lot of money to give it something to rest on. Why do that when you can go to the grocery store, spend a buck on some barley, lentils or rice and put them into a ziplock? Instant beanbag. Any shot of mine you see that’s wicked low to the ground was taken with this. Bug spray. Either this or the stuff like it in a tube it. It’s from 3M and has a wagonload of DEET which is the only thing worth a damn in bug spray. The higher the percentage, the better. The nice thing about the spray is that it works on clothing and doesn’t smell too bad. I put it on and it’s like an anti-bug force field. Of course I don’t need it in the winter, but April through October, it’s a MUST in New England. Anyway, that’s what I use for most of my work and what I usually have with me when I’m out. Anyone have a similar kit? What stuff could you not live without? 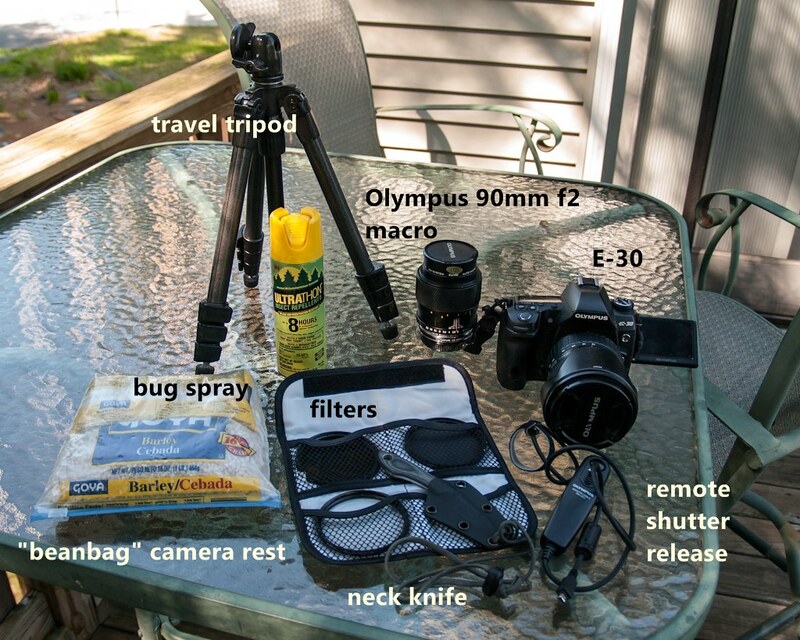 My basic photo kit is Canon, not Olympus, but there is some similarity to your outfit in terms of capability. Except maybe the operator in my kit is not quite as good. For shooting in the woods, I also carry the polarizer and ND, and for lenses I bring the 18-55 kit lens, a 70-300 tele (left over from the film age, this is an incredible bargain in Canon-land), and a 10-20 Sigma. The 60D came with an 18-135 kit lens, but I really don’t like that lens, so I bought a lightly used 18-55 like I’d had on my Rebel that I gave to my son. The 60D has a tilt-and-swivel LCD, and it is a great feature, I also own a G11 and use it extensively on the G11, but I usually compose in the viewfinder if at all possible. I do switch to live view on the 60D for tripod shots after composing because that basically functions as mirror lockup. I also like to shoot in urban locations. Some stuff goes in and some goes out for urban shooting, but that is not really applicable on your blog. I keep a few granola bars in my camera bag no matter what mode of shooting. If I’m going to be out awhile, water also. That’s pretty close to the what my “won’t leave home without it” bag would contain. The only thing missing from yours is a small roll of bathroom tissue for those back woods emergencies 😉 and a little trick Joe Viger told me about, two micro bungy cords. Instead of cutting the vegetation out of the way I use these to hold it out of the way. Not that I’m opposed to cutting off en errant stem or branch mind you. Oh, and as for defense, you are probably better off with a taser. Potentially more effective at accomplishing your goal of disengagement from your attacker, and less legal blowback than a stabbing. Even a justified stabbing is still a stabbing, and you will be paying more to your lawyer for it. eh, I’ve seen tasers fail. They work on the weak-minded who expect to be disabled by them, not on the determined. But like I said, I’m not too worried about it. I love the way you write and your photography is inspiring. You have made new chuckle on a cold rainy day in England. Thanks Lorraine, I’m glad you like it. Come on back as often as you like.